Unplug the power cord from the power outlet. Allow all parts to cool before removing the removable cooking bowl. Wash the removable cooking bowl, stainless steel steaming tray and glass lid in hot, soapy water, rinse and dry thoroughly. NOTE: If rice has cooked onto the bottom of the removable cooking bowl, fill the bowl with hot, soapy water and leave to stand for approximately 10 minutes before cleaning. Do not use abrasive cleaners, steel wool, or metal scouring pads as these can damage the non-stick surface. The housing can be wiped over with a damp cloth and then dried thoroughly. 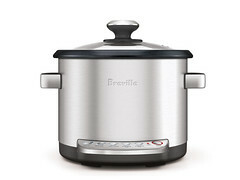 Breville does not recommend that any parts of your multi cooker be washed in a dishwasher as harsh detergents and hot water temperatures may stain or distort the removable cooking bowl and accessories. To prevent damage to appliance do not use alkaline cleaning agents when cleaning, use a soft cloth and a mild detergent. The appliance power plug and connector set must be removed before the multi cooker is cleaned and ensure that the inlet is dry before the multi cooker is used again. To prevent damage to the multi cooker do not use alkaline cleaning agents when cleaning, use a soft cloth and mild detergent. Do not use chemicals, steel wool, metal scouring pad or abrasive cleaners to clean the outside of the multi cooker housing or cooking bowl as these can damaged the housing or the coating of the cooking bowl. Do not immerse housing or power cord in water or any other liquid as this may cause electrocution.